Post-Vegas, my brain is a little fuzzy. I’m now 3 hours off, and I didn’t sleep much last night because I took the red eye into Detroit. Before I am swallowed whole by the coming week, which will involve continuing to draft my dissertation, driving to campus for class, and showing around the new class of recruits, I’d like to take a few minutes to reflect over my favorite moments from this year’s Cs conference. Awesome moment 1: making myself compose with objects in the half day workshop “Evocative Objects.” We brought objects into the workshop, we traded with other participants, and we picked one object out of a bag. Then we had an hour to “compose” with the objects in front of us. I found myself sitting there with an organic paper stationary set, 2 notepads, chalk, and a cloth doll, rolling the paper and unrolling it, situating and re-situating the doll with the other objects before me. I kept thinking to myself what’s my purpose? What am I trying to say with this composition? I tried new combinations and new juxtapositions; I cut up letters and started to spell. Check out my composition here. But the the coolest part of the workshop was having others “read” our compositions to us once they were finished. Being able to see where my own piece was unclear or not as directive as I’d hoped was fascinating. 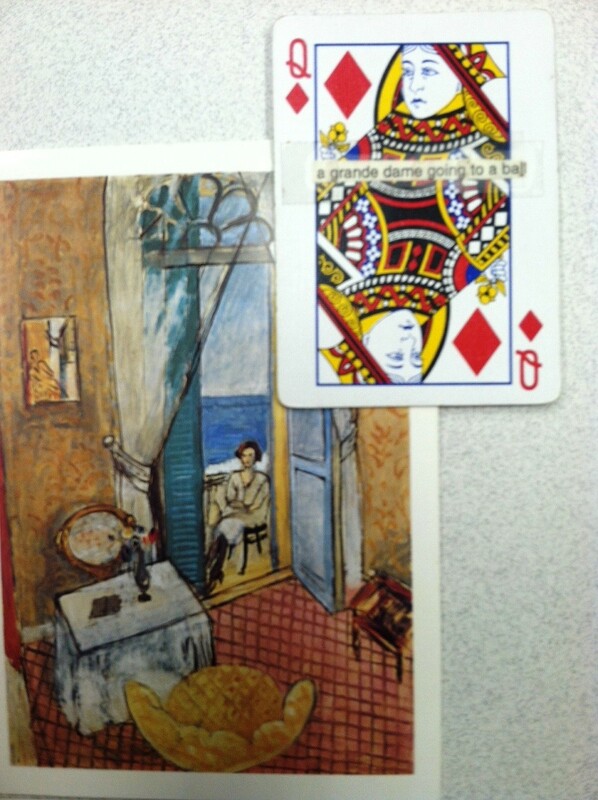 And I also was a little shocked at my own ability to analyze and pick out the messages in the work of others. The entire experience left me with much to ponder about how composing with objects is different from and the same as composing with words. Awesome moment 2: Yancey’s talk on Wednesday at the end of the QRN: “Navigating the Currents of Research Activity on Transfer of Knowledge and Practice in Writing.” It was the end of the day and I was exhausted, but Yancey’s concise summary of the transfer research in the field was so useful. She pointed me to several recently published texts, and made me think deeply about concepts such as the role of metalanguage in our courses. Awesome moment 3: Kevin Roozen talked about transfer of writing knowledge across media in his Thursday morning session with Wardle and Nowacek. He called it “remediation,” drawing from Bolter and Grusin. I was just excited that someone else was actually going there. Awesome moment 4: Saying hi, ever so briefly, to my wonderful mentor Lisa Ede after her feminist rhetorical practices panel on Thursday. She is so wonderful! Awesome moment 5: My favorite panel of the conference was “Compositional Expansion: De- and Re-Composing Materialities” with Jody Shipka, Erin Anderson, and Trisha Campbell. Dr. Shipka showed her latest video, which was layered and complex in exciting ways. She layered together found home-video footage and sound material, along with a ghostly image of herself on the side – reminding me that there she was, underneath it all, mixing and remixing the materials. Some of the sound she used came from her classroom and some from interviews with others, and she layered multiple sound tracks at various points in the movie. The video we watched isn’t up on her website yet, but she has posted many of her other projects there. Erin Anderson then showed us her “Coerced Confessions” remix videos– she uses digital video editing to remix the words of actors into confessional statements. The videos are jarring and bizarre, but suggest much about what can (or should) be done with digital voice as a compositional medium. Finally, Trisha Campbell finished the panel by showing her “Composing Murder” project, where she maps and composes a network for the murders that take place in Pittsburgh each year. She also collects evidence of the victims’ digital imprint, archiving Facebook pages and images. I was emotionally moved by Campbell’s project and think it could have an important impact as a tool for the community, but it also challenges my notions of composing new media. Is her archive a composed text? Awesome moment 6: Presenting with Chris Dickman and Ben Gunsberg during the last session to a much larger audience than expected! People hung in there for us, and we had a great showing. I talked about my dissertation research, and Ben and Chris showed really interesting work relating to making video resources for students and having students compose screencasts. And there were other awesome moments, too – hanging out with others in my program, seeing graduates and catching up on their lives, seeing the fountain show at the Bellagio, and realizing that writing teachers, well, we just rock! But I already knew that before. Thanks, Cs 2013 and everyone involved, for a great conference! We’ve done 2 composing activities in my Computers and Writing class over the past few weeks, so I thought I’d post images of my compositions here. 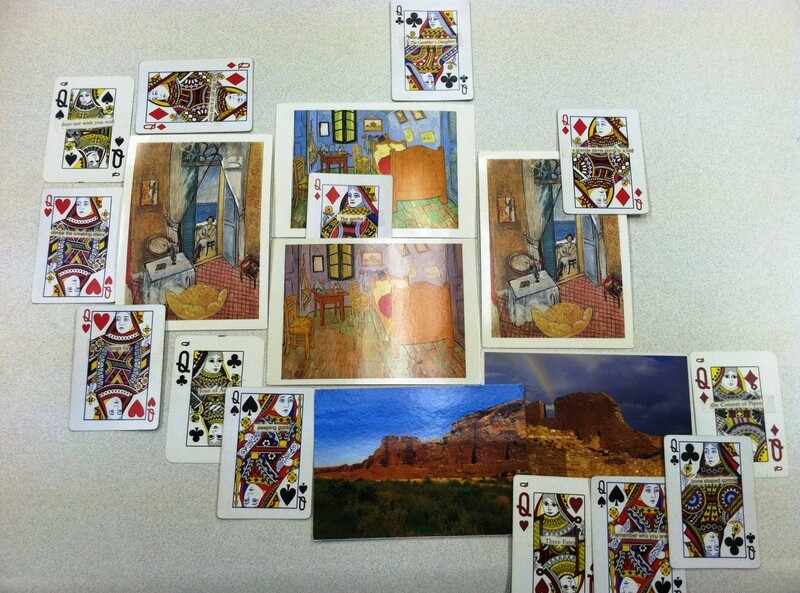 The first composition is my image poem “Land of the Queens.” I composed using postcards and playing cards that some of my classmates provided, using repetition and juxtaposition as compositional strategies. Today, we composed with rhetorical terminologies that we picked from a list – mine was “oxymoron,” a figure of speech that combines contradictory terms. 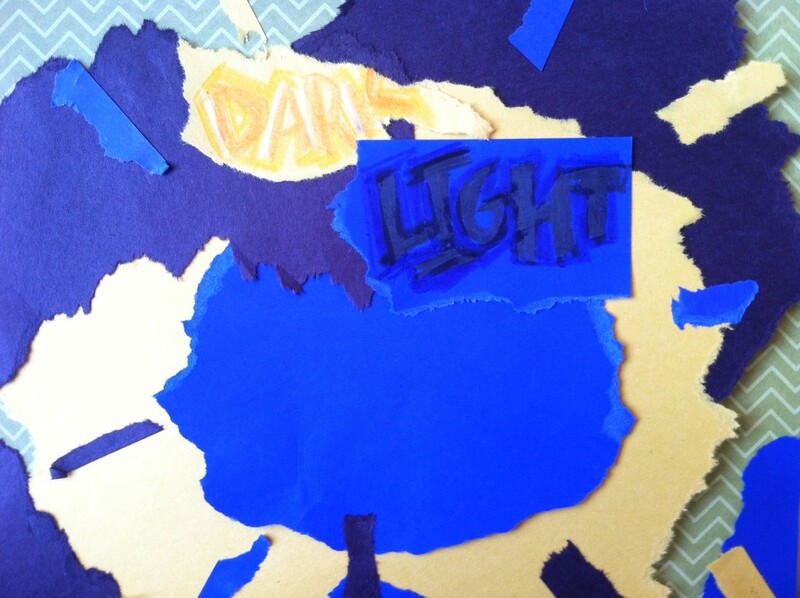 My composition is “Dark Light,” made from ripped construction paper and some crayons. I’ve thought a bit about the element of play while composing both of these pieces. For “Dark Light,” I ended up ripping the paper because someone else was using the scissors, but then I liked the ripped look and kept going. For “Land of the Queens, ” I started using repetition because I saw 2 identical postcards and wondered what else I could find 2 of. For both compositions, I ended up somewhere that I didn’t originally intend because of playing around with the available materials and making due with the resources I had. I met with my 5th committee member today, told him about my project, and asked him to officially become a member. He said yes – but was surprised that I am choosing (so willingly) to have 5 committee members. I am a little worried myself about juggling all the feedback. Already I have received some conflicting advice and different reactions. One area that my committee members have different views on is my idea to make the dissertation and the prospectus multimodal in some way -which probably means including some video if I can for data presentation. I have received the following pieces of advice from different people: 1) don’t worry about the irony of composing a print dissertation about new media composition; just write it. 2) Don’t attempt to do anything multimodal because we’re not ready for that yet. 3) Do it – it sounds exciting and wonderful. 4) I’m on board, but I have no background knowledge about composing with video. And I don’t read on a screen. 5) Using video makes sense for data presentation (perhaps for showing interview footage of participants) but not anywhere else. In an ideal world, my diss would be able to house videos and written text, and it wouldn’t take me 3 times as long to compose a short video. But in reality, readers can’t read pdfs with embedded video in the ways they are used to. Some readers think that including video is just using “bells and whistles.” And I don’t have all the functional knowledge I need to do it well yet. But I WANT TO! Perhaps the diss just isn’t the place, though. A second area to consider, which the committee member I met with today gave me lots of advice on: do I try to study others implementing instruction in new media composition, or do I do the lessons myself and study the outcomes for students? Originally (back a few months ago) I wanted to implement the curriculum myself and study my own students. But I was advised against that by a few professors and mentors. So I had the idea to create a unit and have others implement it and study them, the instruction, and the students. But today, my 5th committee member advised me to implement the curriculum myself. His argument was that I’m not actually studying myself at all, but the instructional moves I’m making and what the learning outcomes are for students. But now I’m just confused – study a unit I do with my own students or study a unit others do with their students? Either way, I’m studying the unit and its outcomes. Just when I think I’m coming to a point where I know what I want to do and I think I know how to put it together, I get thrown for a loop.